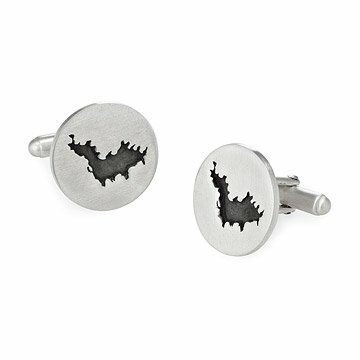 Keep the memory of a special lake or island right on your shirt sleeve with these chic cufflinks. From dives off the dock of your grandparents' lakehouse to tumbles in the roiling sea that surrounds an island close to your heart, bodies of water stir a depth of emotion in us and shape our impressions of our favorite spots. Honoring select lakes and islands in an understated way, Melissa Fedor-Baroni's chic cufflinks keep the memory of a special place right on your shirt sleeve. Inspired by the love she and her husband share for the Caribbean island of St. Barth, the artist cuts a silhouette of your choice of lake or island out of a slick, sterling silver disc. To give the cut-out additional oomph, she oxidizes the silver making the distinctive form standout. Each pair of links exhibits a sleek, high-design aesthetic and makes a thoughtful anniversary, birthday, or Father's Day gift for the dapper gent. Handmade in New York City. Before launching her unique collection of jewelry featuring borders of the world, Melissa spent her career as a fashion and beauty editor at illustrious women's magazines in New York City. Wanting to spend more time at home raising her four children, Melissa gave up full-time work in favor of founding a business of her own. Melissa's inspiration for this modern line of intricately crafted accessories, including countries, states, islands and lakes, was a combination of the great designers she was exposed to as an editor as well as the wonderful travels she and her family have enjoyed. While visiting Switzerland or Morocco, Italy or France, St. Barth or St. Lucia, California or Cape Cod, Melissa would often search for something beautiful and meaningful to commemorate these special places she and her family discovered and came to love. She also wanted something that would pay homage to her ancestors, her roots, the places she and her family call home. When she realized the choices were few, she decided to create a collection of beautifully handcrafted pieces that celebrates where one is from and where one has been. When Melissa is not busy building her jewelry business and traveling, she loves to run with her dog, do yoga on her terrace (weather permitting), play Scrabble with her family, cook for large crowds and write for a new food blog she hopes to launch in the near future. Our matte silver pieces require little care, but if you feel your pieces need brightening, you can use a soft toothbrush and warm soapy water to clean. Do not use a polishing cloth, as it will ruin the matte finish. You can clean with a silver polishing cream, such as Wright’s Silver Cream, if needed.